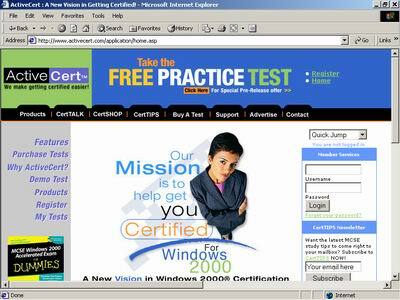 Can a Web-only exam-prep product get you ready for the Windows 2000 tests? The answer here is "yes." It seems that Windows 2000 practice-exam vendors have multiplied faster then free-range bunnies in the last year-especially in the last three months as the NT 4.0 MCSE upgrade deadline looms ahead. With so many choices, it's not only difficult to select the right vendor but just as challenging to select the right delivery media-paper-based, Windows 32-bit custom test engine, or a completely Web-based solution. 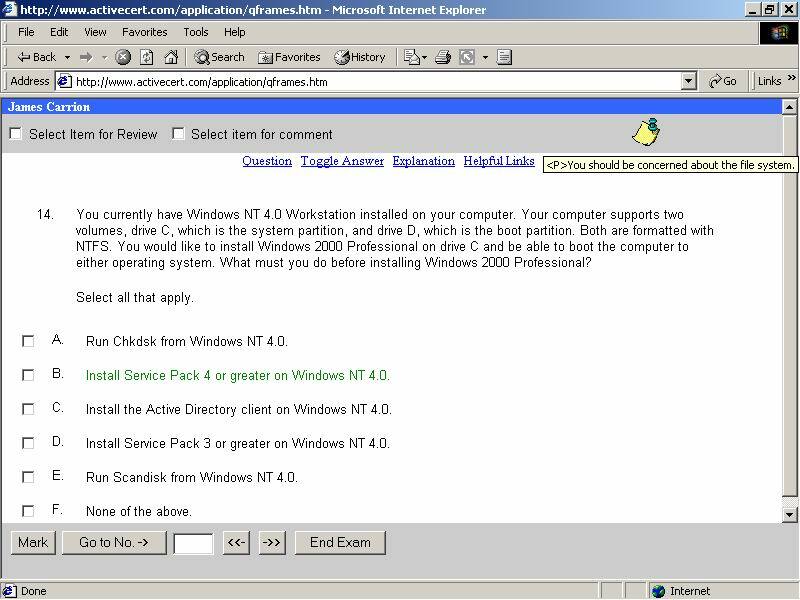 Because I've reviewed many practice exam solutions that come as traditional WIN32 applications on a CD, I thought it'd be great to take a look at one that's completely Web-based. This month I look at a relative newcomer to the practice exam field: ActiveCert.com, www.activecert.com. After purchasing your exams online from ActiveCert (Figure 1), you can logon using the username and password you received from the registration server. Once you've successfully authenticated, you can click on the "My Tests" link to display a listing of the exams you've purchased. Each exam has four study modes: Deep Study mode, Quick Study mode, Mixed Study mode, and Fast Facts Review study mode. In Deep Study mode, shown in Figure 2, the exam questions are longer and harder than in the other study modes. The answer explanations are also more complete, with the goal of teaching you subject matter for the objective being tested. Deep Study mode also includes a variety of additional learning materials such as audio explanations, how-to exercises, screen images, tips, training videos, and links to external third-party Web sites. I found the links to third-party sites (mostly Microsoft Knowledge Base articles) a valuable feature. If I found myself disagreeing with an answer, I'd immediately follow the links to review the source technical documents. Where Deep Study mode is designed to let you linger on a question so you can learn the objective being tested, Quick Study mode is designed for the person who's already mastered the objective and is looking to test their knowledge by answering shorter questions. The answers and explanations are also more matter-of-fact and to the point. Mixed Study mode is nothing more than a combination of Deep Study and Quick Study modes. Finally, Fast Facts Review mode is a compilation of critical exam facts, listed by objective, which can be used as a cheat sheet to refresh your memory just before taking a test (just don't take it into the testing center with you!). Of the four modes described, you'll probably find Deep Study mode to be the most beneficial for learning Win2K subject matter and Quick Study mode for exam readiness assessment. I found the Web-based test engine to be functional, though not as feature-rich as some of the competing practice-exam products distributed as WIN32-based applications. For example, many WIN32 test engines will not only randomize questions but also the order of answers or will remember the questions answered correctly. This helps if you take the exam again, as it'll focus on presenting only the questions you'd previously answered incorrectly. These features are lacking from ActiveCert, but I think they could be easily implemented. I was impressed, though, by ActiveCert's ability to replicate the look and feel of the real exams-complete with exam timer, drag-and-drop questions, point-and-click questions, a review screen, and the ability for a test taker to comment on questions. The comment feature is a great way for ActiveCert to get feedback from its clients so that inaccurate technical content or ambiguous questions/answers can be corrected. I like the Web-based test engine concept, but can it really be a viable and comprehensive platform for practice exam content delivery? I think so, but there are technical challenges, such as browser compatibility. From what I could see, the ActiveCert site is primarily dynamic HTML-based and appears to be ActiveX control-free, which helps in the browser-compatibility department. The other issue is maintaining the connection state. The last thing I want is to spend an hour going through an online practice exam, only to have my exam terminated because of network latency or other Internet connectivity problems. Instant and correct feedback is very important to the test-taking process. Although I didn't experience these connection issues while reviewing the ActiveCert site (through my satellite connection), it's something of which ActiveCert, along with its Web-based competitors, must be conscious. This is even more important when providing content to users with low-bandwidth Internet connections. I found the technical content not only quite accurate but also very representative of the exam objectives. The content creators have done their homework here and offer you the right technical facts in the right dosage to help prepare for the Win2K exams. The answer explanations are thorough and promote learning, especially when used in combination with the links to third-party technical documents. 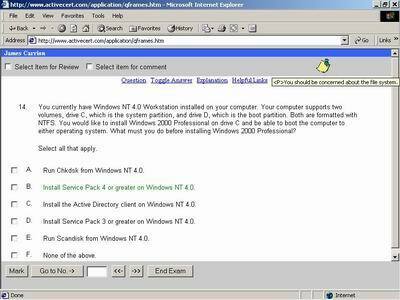 Does this mean that you can pass the Win2K exam with just these practice exams in your tool belt? Not likely, as you'll still need a good measure of hands-on experience, troubleshooting know-how and solid NT 4.0/Win2K knowledge to pull it off. I like this product primarily for its technical accuracy and comprehensive coverage of exam objectives. Although the Web-based test engine isn't as feature-rich as a WIN32-based test engine, it's functional enough to do the job, especially when simulating the look and feel of a real exam. I also think the Deep Study Mode, with its comprehensive explanations and links to other technical documents, serves as an excellent learning tool to help you prepare for the exam by building your own Win2K knowledge base. If you're looking for a practice exam that gives you that needed edge to pass your Win2K MCSE exams, ActiveCert delivers.